Hello everyone! Admin Mary here. It’s hot outside. That means I am not making as much progress as I would like on my own Bear’s blanket. However, I did finish up a little postage stamp blanket – which I will share with you in a minute. 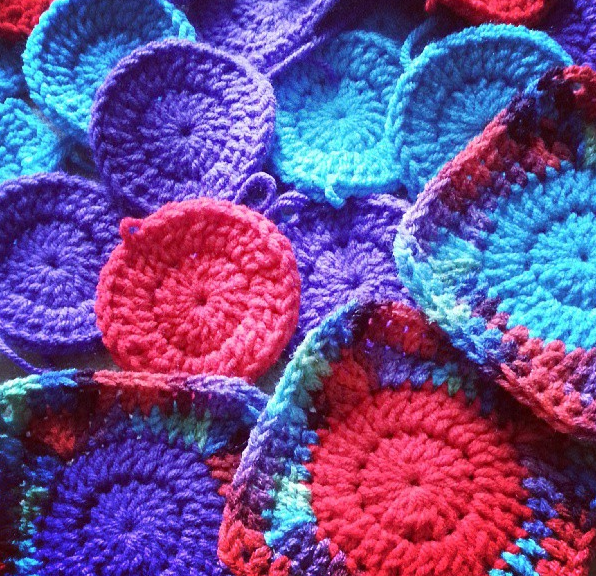 For now, I have to show you some amazing finished scrappy blankets from Rachel! This little scrappy postage stamp has a background of pink. I’ve always wanted to do this and just can’t seem to match my colors right. Rachel makes it look simple… and beautiful! Postage Stamp Scrappiness in all it’s glory! Look at that little cutie in the center! 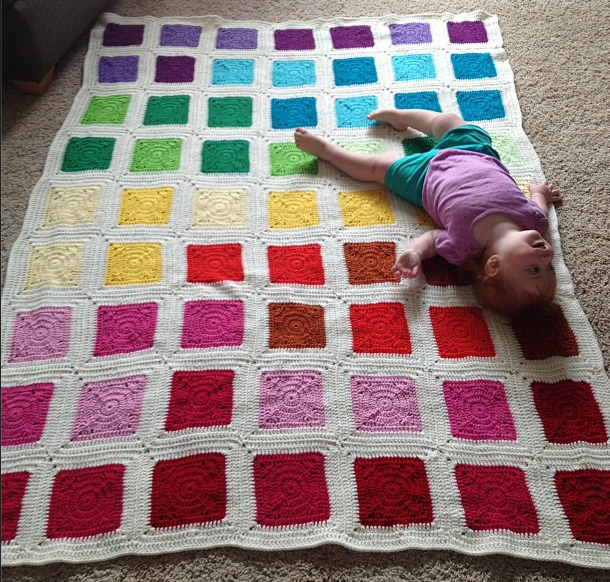 Speaking of cute little babes on a blanket, look at this scrappy Bear’s Blanket from tabelite25! The colors are so yummy! aemeabe is on her way to finishing her Bear’s blanket, too! She is sewing hers together from what I hear. I can’t wait to see the finished result! artsybit wasn’t sure on these colors… but I think they look great together! Love the warms and the cools meshing together! 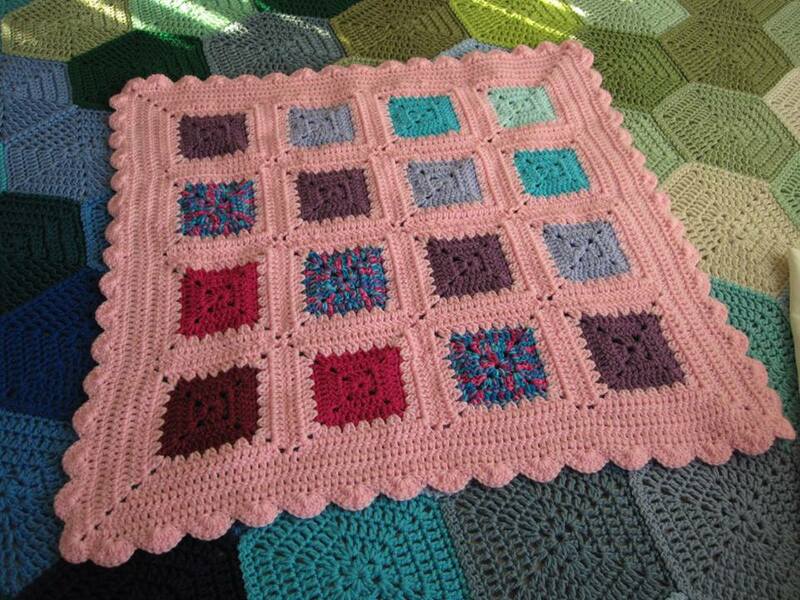 And lastly, my little postage stamp scrappy baby blanket! I’m always in shock that I have that many colors laying around. I’ll admit it – I hoard acrylic yarn. I have to have one of every color. I can’t resist. I can’t wait to see the progress as everyone continues their scrappies! I am still working on my Bear’s Blanket, so hopefully I can finish that one up and unveil it soon, too. 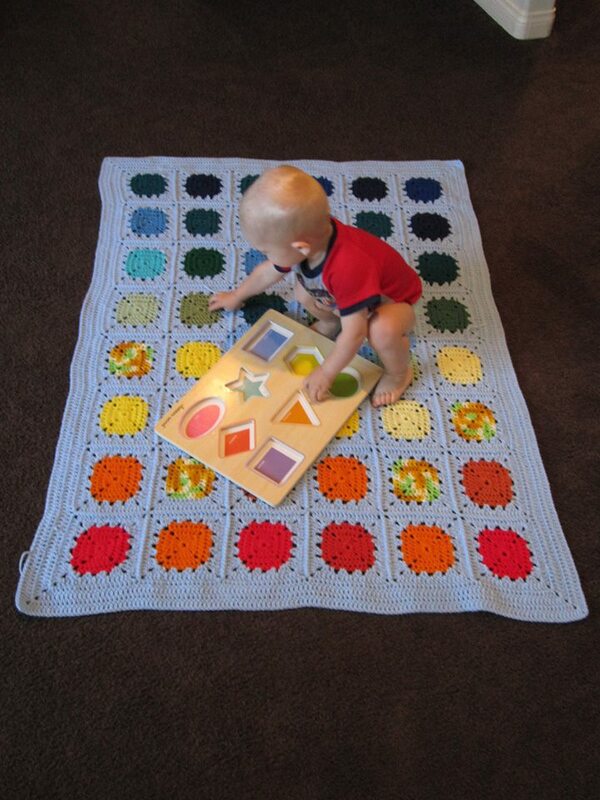 Keep in mind, scrappy blankets are not limited to postage stamp and Bear’s Blanket only. 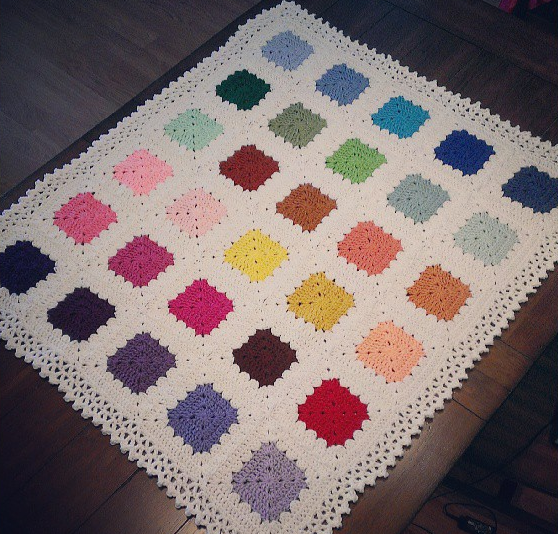 If you have any other pattern you use for your scrappy blankets, I would love to hear about them! The more, the merrier! I have two secret ones in the works… more on them later! 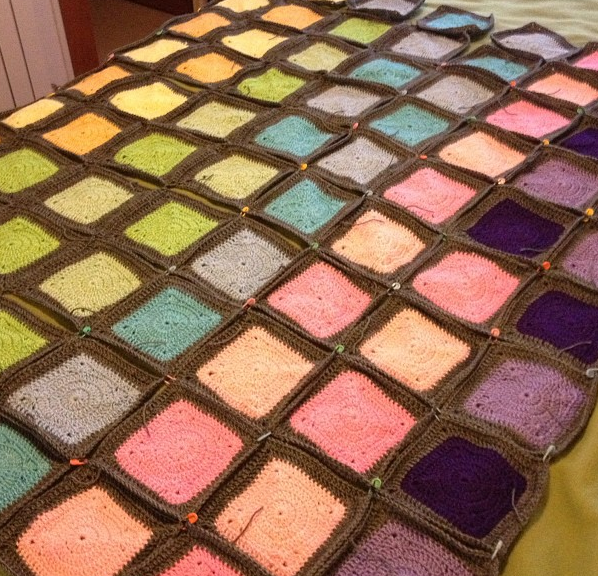 I am using this block as my motif for the Bear’s Rainbow Blanket CAL. It’s a little pattern I wrote that I’ve been meaning to use for a long time! Round 1: SC in ring and Ch 2. (3 DC in ring, Ch 1) three times in ring. 2 DC in ring and join to first chain, leaving the second chain as the corner chain. Round 2: SC in corner chain and Ch 2. 2 DC in corner. (DC in the next 3 sts, *2 DC, Ch 1, 2DC* in corner) three times around the square. DC in next 3 sts and DC in corner. Join in first chain, leaving the second chain as the corner. Round 3: SC in corner chain and Ch 2. 2 DC in corner. (DC all sts across, *2 DC, Ch1, 2 DC* in corner) three times around square. DC in all sts across final side and DC in corner, joining in first chain. Cut yarn and finish off. 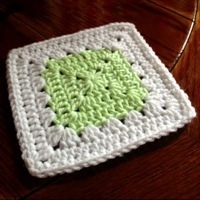 Join border color with a slip stitch in any corner. Round 1: SC in corner chain and Ch 2. 3 DC in corner. ***(Skip 2 sts, 3 DC in next st) three times, *3 DC, Ch 1, 3 DC* in corner)*** three times around the square. (Skip 2 sts, 3DC in next st) three times. 2 DC in corner and join in first chain. Round 2: SC in corner chain and Ch 2. 2 DC in corner. (DC in all sts across, *2DC, Ch 1, 3 DC* in corner) three times around square. DC in all sts across, DC in corner and join in first chain. Round 3: 3 SC in corner chain. (SC in all sts aross, 3 DC in corner) three times. SC in all sts across and join to first SC. Cut yarn and finish off.